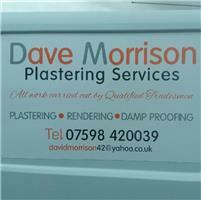 Dave Morrison Damp Proofing & Plastering Services delivers an exceptionally high standard of work, providing a clean, tidy and professional damproofing and plastering service every time. We have 25 years of experience within the trade covering all aspects of damp proofing inlcuding damp investigation and damp survey we can also undertake plastering including patch work and a full house re-skim and colour rendering. Please feel free to have a look around my website on the link above, for a bit more detail and information.